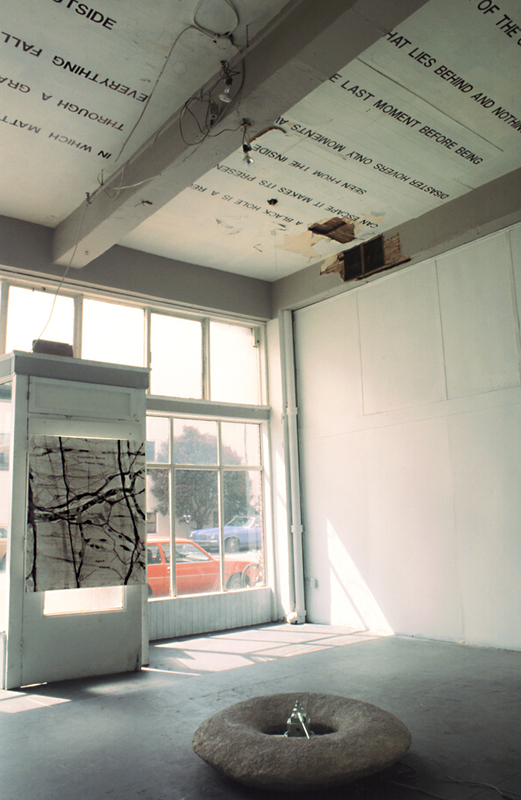 Sculptural installation concerned with maintaining a focus between the inner and outer parameters of the gallery space. 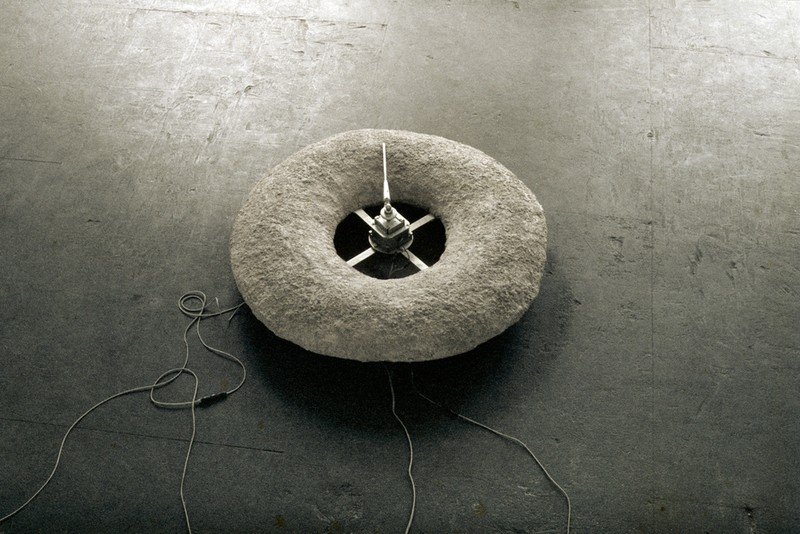 The installation involved a central concrete ring form equipped with a revolving arm traveling across the surface at one interval per minute. Microphones embedded in the form itself reverberate the sound of this motion into and out of the gallery walls. 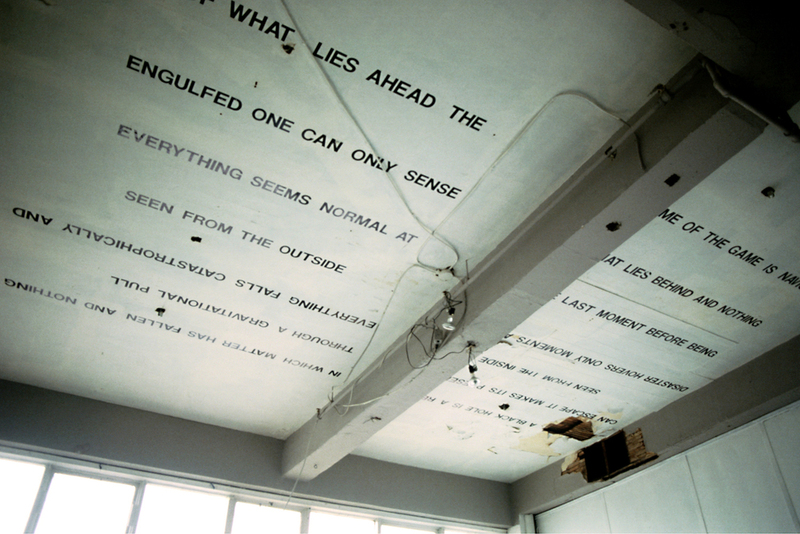 Text on the ceiling as well as a photo are combined to form a collaboration of elements which also include s a large electron microscopic image of a nerve bundle magnified several million times. Ron Huebner’s installation ‘May the Circle be Unbroken’ borrows from the structure of black holes. they are explained in Einstein’s theory of relativity in the following way: the passage of time is delayed by matter and speed. Allow they are allowed to exist from this theory, nothing proves their existence. It is said that nothing emerges from black holes. Stars, interstellar clouds and planets which get too close are swallowed by them. Because the structure of black holes is not fully understood, there is no consensus about the ultimate fate of material consumed by these gravity whirlpools. Matter disappears, totally engulfed. In the tradition of landscape painting, the tranquility of the sky has evoked visions of the sublime. Huebner does not rely on celestial phenomenon as a source of contemplation. His sculpture evokes our society’s present condition, facing uncertain but unavoidable change. Huebner’s entire work probes the tension between the will to take action and apathy, the danger of action and the wish to escape the torpor of matter. The essence of this installation is based on our incapacity to move through information and reality.